There's talk about self-driving cars in the near future. But, after ringing it in our ears for over a year, major online retailer, Amazon is now set to launch a self service-cashier-less and cashless retail store in Seattle, USA. There are self-service machines in many retail stores. But Amazon has stepped it up a notch. In this store, you don't get a self-service POS Machine. Neither do you need cash or card to shop? All you need to do is walk in, shop, and go! Amazon says "We asked ourselves: what if we could create a shopping experience with no lines and no checkout? Could we push the boundaries of computer vision and machine learning to create a store where customers could simply take what they want and go? Our answer to those questions is Amazon Go and Just Walk Out Shopping. 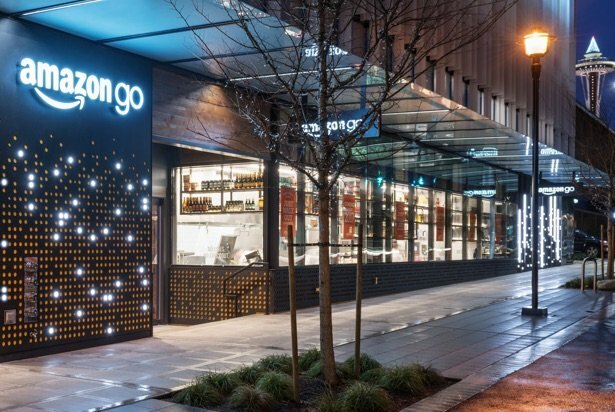 The company added that "Amazon Go is a new kind of store with no checkout required. We created the world’s most advanced shopping technology so you never have to wait in line. With our Just Walk Out Shopping experience, simply use the Amazon Go app to enter the store, take the products you want, and go! No lines, no checkout. (No, seriously.)" You will need an Amazon account to use this service though. Amazon explained that "our checkout-free shopping experience is made possible by the same types of technologies used in self-driving cars: computer vision, sensor fusion, and deep learning. Our Just Walk Out Technology automatically detects when products are taken from or returned to the shelves and keeps track of them in a virtual cart. When you’re done shopping, you can just leave the store. Shortly after, we’ll send you a receipt and charge your Amazon account. "We offer delicious ready-to-eat breakfast, lunch, dinner, and snack options made by our chefs and favorite local kitchens and bakeries. Our selection of grocery essentials ranges from staples like bread and milk to artisan cheeses and locally made chocolates. For a quick home-cooked dinner, pick up one of our chef-designed Amazon Meal Kits, with all the ingredients you need to make a meal for two in about 30 minutes," said Amazon on its website. 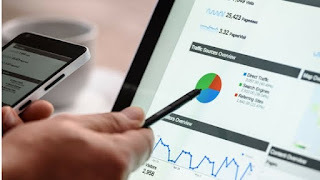 The company added "all you need is an Amazon account, the free Amazon Go app, and a recent-generation iPhone or Android phone. 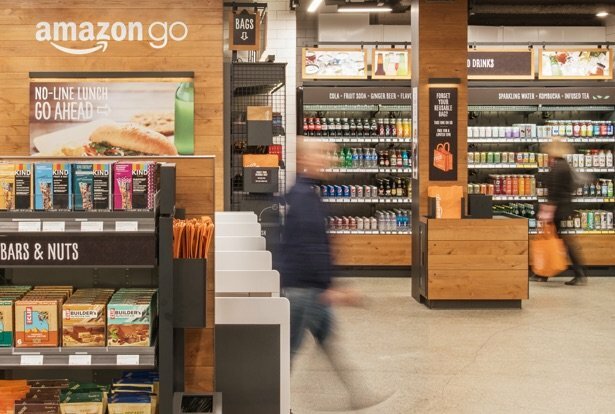 You can find the Amazon Go app on the Apple App Store, Google Play, and Amazon Appstore. 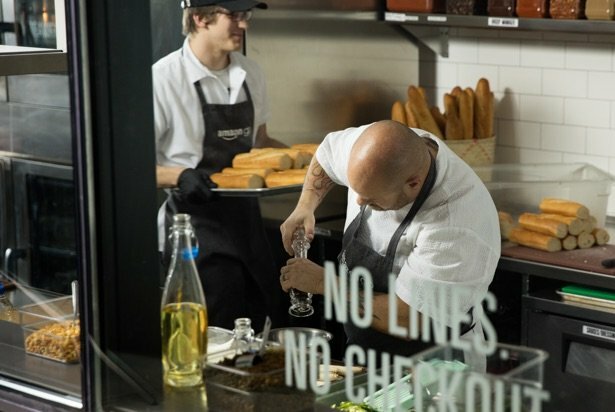 According to an advert for Amazon Go, when you arrive Amazon's shop, you can use the app to enter the store, (apparently, with no app or Amazon account, you get no entry). 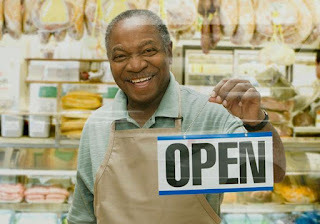 After entering the store, you can then begin shopping. Oh, by the way, you don't need the phone to shop. So you won't be scanning items with it. Once you’re done shopping, you exit and that's it. According to Amazon, it is strictly, "No lines, no checkout." And let's add, no money changing hands and no petty shop robbers hanging around. However. there are still people (real humans) working in the store thankfully. It's bad enough that Robots are taking away people's jobs already. The company says "Our great team of associates work in both the kitchen and the store to prep ingredients, make our ready-to-eat food, stock shelves, and help customers." (Sigh). At least, when you have a question about a product you can find a human to ask and it won't just be you and your mobile phone. I mean, you could ask your mobile phone, but hey, it would be much easier and faster and you won't have to wait for a customer service Rep who is probably many miles away in India responding to a query on a product in a store in Seattle. Now that would be awkward.